We proudly recommend kitchen faucets from Moen! 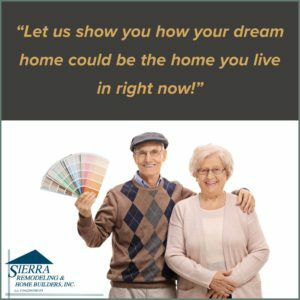 The Sierra Remodeling Sales and Design team can help you narrow down the kitchen faucet that is just right based on your design and functional requirements. Visit our showroom floor located at 1840 S. Highway 92 in Sierra Vista, Arizona and, we will help you select your Moen faucet. Give us a call at (520) 459-3164. Sierra Remodeling’s Design team wonders, “Why touch your kitchen faucet when you don’t have to?” Thoughtfully designed with you in mind, Moen’s MotionSense™ hands-free technology makes completing kitchen tasks easier, detecting your movements and setting water flow in motion with just the wave of a hand. The two-sensor touchless kitchen faucets with MotionSense feature touchless activation, allowing you to easily turn water on and off with the wave of a hand. The Ready Sensor sits below and is ready when you are. The Ready Sensor detects any object, like a cup or a hand, making everyday tasks easier for you. The Wave Sensor sits above and enables you to wave hello to convenience. The Wave Sensor detects your hand movement to activate water flow. Wave goodbye to dirt and germs and wave hello to hands-free. Handle – stay in control. The handle offers familiar, manual operation, allowing you to adjust temperature and water flow. Sticky, caked-on messes are all too common in the kitchen sink. Delivering on its commitment to fulfill unmet customer needs, Moen is introducing the new Power Clean™ technology to select kitchen faucets. The Moen new Power Clean™ Technology provides more force to get tough jobs done. Powerful spray – greater force means faster cleanup. With optimized cleaning force, Power Clean spray provides 50% more power than Moen pulldown and pullout faucets without Power Clean, while containing splash and minimizing the mess. Effortless return – self-retracting action. Flexible hose – easier maneuverability. Every part of a Reflex faucet works in unison as a complete system of innovations. The flexible hose moves with you to make your everyday tasks more convenient. Our Sierra Remodeling installers will show you how the Reflex faucet works! Maintain the Brilliance of Your Faucet. Spend more time enjoying your new Sierra Remodeling kitchen and less time cleaning it with Moen’s Spot Resist™Stainless and Brushed Nickel finishes. Spot Resist does just what it says, preventing water spots and fingerprints. Resists build up – a clean finish. Spot Resist lets you maintain a brilliant finish by preventing the unsightly build up of fingerprints and water spots. Turn your ideas into reality. Learn about everything from faucets to filtration, see how we’re constantly innovating and hear about Moen’s commitment to conserving water and reducing global waste. Because you didn’t just buy it for looks; you bought it for life. The next level of protection. 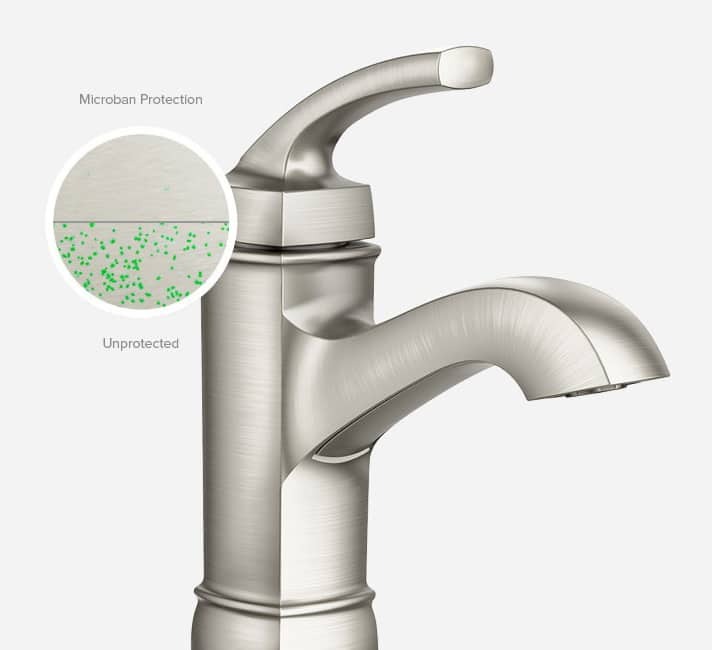 The Microban® finish helps prevent the growth of harmful bacteria on your faucet surface. Fights infectious microbes – cleaner, longer. Microban® antimicrobial helps inhibit the growth of stain-and-odor bacteria on your faucet’s finish, so you can spend less time cleaning. Microban antimicrobial protection is built into the faucets finish to fight against living microbes. Microban technology works continuously and won’t wash off or wear away with normal use, which can help keep the faucet finish cleaner for longer. Learn more about our Moen kitchen faucets! Visit our showroom floor located at 1840 S. Highway 92 in Sierra Vista, Arizona or give us a call at (520) 459-3164. Sierra Remodeling and Home Builders, Inc. made a cathedral ceiling by cutting out some (roof) trusses. They did excellent work. They did what I wanted them to do. All the other contractors told me I couldn’t do it. They were the only people who would entertain the idea and they did it successfully! I also remodeled 2 bathrooms and a kitchen with them and it was good work. They also did some double pane window replacements and a double pane sliding door for the patio and they did excellent work there as well.